Derek B. Gayle recaps and reviews the October 26 episode of Fringe. Summary: We came for the return of Broyles, we stayed for the heart-pounding action, and we left with those hearts viciously ripped out. This one will be remembered. If you have not seen this episode yet and don’t wish to be spoiled, don’t continue reading. No, seriously. I got spoiled on it and it was the worst thing imaginable. I’m not kidding. Peter goes into the city to get gas and find a silver chain to replace Etta’s necklace (which was used for solder back in “In Absentia.” ) An Observer comes across him, however, and begins reading him; Peter tries to block him out using techniques Etta taught him, but the Observer catches on and gets an image of Etta. Peter gets away in a nearby sewer, though not without being caught in a grenade explosion. Upon making it back to the lab, Peter laments the team’s inability to block the readings as good as Etta can, and doesn’t know how to beat the Observers. Etta reassures him that it just takes a long time to learn; Peter gives her the new chain as a gift. The team uncovers tape 2 from the amber, but it’s ripped and stops working before it can explain more. Thanks to tape-Walter’s ramblings, though, Walter is able to deduce where the next part is—in the Penn Station subway, where he used to hide things as a boy. Unfortunately, Observers have checkpoints at every station. Back at the store, Windmark investigates Peter’s appearance and calls in Broyles to help him understand why Peter would risk so much to get a necklace chain. He suspects they’re receiving help from the Resistance. Even worse, one of Broyles’ men didn’t pass a security test, and Windmark suspects he’s a mole. The mole is interrogated, and reveals the existence of both the Harvard Lab, and a man called “The Dove” who is somehow connected to the Resistance. The team goes beneath the lab, where they discover Walter has collected numerous artifacts from the past four years of Fringe events. They decide to make their own Fringe event with the materials to get into the station—in this case, using the tissue-generating toxin David Robert Jones created from season one’s “Ability.” After suffocating most of the guards, the team makes it inside, and discover blueprints with complex equations on them hidden in Walter’s old hiding spot. They escape, and Etta reveals she’s contacted Broyles—and in fact, they’ve been working together the whole time, though she kept it a secret in case one of them got read. Broyles, who works with the Resistance, takes the blueprints for safe keeping. However, Etta realizes that the Loyalists placed a tracking device on their car and are on their way; they each split up and escape. In an abandoned warehouse, Etta gets cornered by Windmark, who continues to ask why Peter would go to such lengths to buy her that necklace. He realizes that love is why, and after getting his answer, he shoots Etta. Peter, Olivia and Walter find Etta as she lays dying; Etta has a grenade that she’s left ticking and commands her family to leave. After a tearful goodbye, Olivia takes her daughter’s necklace and they escape, just before Observers arrive to be caught in the explosion. Well, I asked for a return to the action after two weeks of slow development. Now, it looks like the show decided to take it a step further and shake things up completely. Etta essentially made up something of a “Big Four” for the final season, being the only character that really felt like she belonged with the main Olivia/Peter/Walter trifecta that had carried the show for four years. It seems that was an intentional tease, though, and one carried out painfully well. There’s something to be said about any show that can pull of an actual death shocker and do it well. Fringe has sort of done it in the past—Charlie’s death in season 2 was out of the blue, but it also lacked any real artistic merit outside of the shock factor. There’s a bit of brilliance with Etta here considering just how important the character has been thus far. She’s been the spotlight of multiple promo shots, she was practically the star of “Letters of Transit,” and being the “special” daughter of Peter and Olivia has been teased since season 4. Sure, it seemed weird that Georgia Haig was only a guest star, but that could have been written off as cost-cutting measures, since Lance Reddick and Blair Brown are no longer regulars either. But despite being the personification of, well, everything important—the Olivia/Peter love story, and their importance to saving the world—she gets shot just like it’s nothing special. Well, it’s filmed like it’s special; the flashes to the dandelion we’ve seen so frequently and the deafening silence are effective in twisting the knife as soon as we realize how this is going to turn out. Once Peter and Olivia find her, it’s even more haunting; Joshua Jackson especially manages to convey an insurmountable heartbeark. It’s a poignant ending cinematically, but the circumstances of it are rather mundane in the context of the show. They got the piece they were searching for, they went on the run, and they got separated. Etta just didn’t get rescued soon enough, and ironically was doomed because of Windmark’s obsession with understanding “love.” Had Peter not bought that chain out of love, Windmark wouldn’t be on their trail. Love is supposed to be this big concept that’s going to save the world, but if Etta really was as important as September said back in season 4, then love just screwed the Fringe team over big time. It’s twisted and dark, and it’s incredibly cynical, but it’s satisfying in the most horrible way because it twists the show’s pre-existing themes so well. Where does the series go from here? If the show wanted to make us continually as uncomfortable as the characters feel, with its constant shifts of the status quo, it’s doing a stand-up job of it. Even though nothing in the overall world has gotten worse, there’s still never been a bigger sense of dread than there is now. Peter and Olivia had enough issues as it was; there’s no reason this won’t break one or both of them completely. I have absolutely no idea where the series is going to end up and how this will play out, and the fact that Fringe has managed to be so unpredictable is a great treat. But contrary to how memory may serve down the line, there were some other things going on here, too. Despite a substantial amount of screen time, Broyles’ return—while long-awaited–wasn’t as triumphant as one would expect. 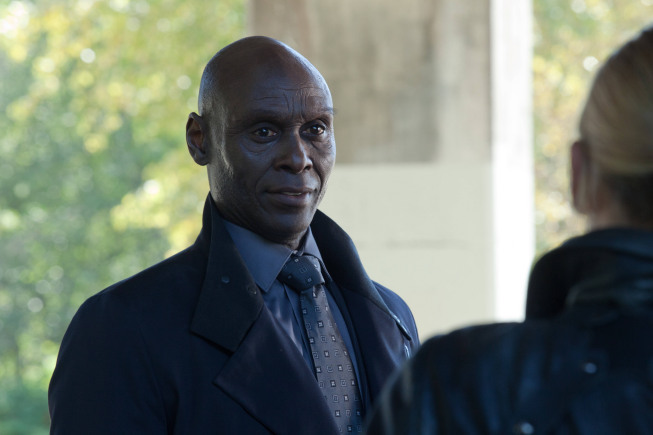 Lance Reddick mostly just had to stare a lot, and had a little bit of vaguely-passive-aggressive dialogue with Windmark, but not much else to do. His reunion with Olivia, however, was very sweet and well-played. It’s just nice to see him in general, and to know for sure that he’s still been on the side of good this whole time. The “Fringe events as weapons” idea is a stroke of genius, and it had better get more use. It’s a very cool tribute to the early days of the show, bringing things full circle in a way similar to (but better than) season 4’s retreads of season 1 mysteries. It was fun (in a morbid way) to see the tissue-generating toxin, one of the show’s more memorable and freaky concepts from way back in season one’s “Ability,” make a comeback. There are so many horrific things they could do to the Observers with Walter’s collection; if they’re going to have an all-out war with them, why not go out with a bang using the stuff that made them form a Fringe team in the first place? The titular “bullet that saved the world,” though not overtly revealed, is presumably the one Walter shot Olivia in the head with back in “Brave New World.” It’s a relatively mundane reveal, considering the countless teases of Etta caressing it. But it’s satisfying in a weird way; it’s a visual representation of Etta and Olivia’s mother/daughter bond, and there’s something poetic about it passing from Olivia to Etta and back to Olivia. It also kind of foreshadowed Etta’s death; she sacrificed her life for the sake of the world, like her mother. Though unlike Olivia, Etta isn’t coming back from her sacrifice. Well…maybe. Who knows what’s going to happen next. But despite the heavy stuff at the end, not a whole lot really happens this week. There’s some joking and running around and lots of staring, but it’s definitely an episode written to keep the audience moderately interested until they get slapped in the face with the final shocker. But since that seems intentional, there’s no reason to deduct points considering how well it all paid off. Because frankly, this one’s a doozy, and completely revitalizes a season we didn’t even think needed to be revitalized. Windmark playing the Simon game is pretty great. Walter’s prized possession as a boy was his collection of Detective Comics. Awesome. Peter specifically pointing out the viewing portal to the other universe means we’re definitely going to see what they’re up to, right? Any scene with Broyles and Windmark is like The War of the Makeup. Don’t get me wrong, I commend the makeup team for creating the 20-years-older Broyles, but the close-ups unfortunately make it a little too obvious sometimes. For a little while, I was trying to wrap my head around whether or not the team would have encountered that toxin from “Ability” in the post-season 4 timeline, since they made it clear the David Robert Jones stuff from season 1 didn’t happen then. But honestly, it’s best to just ignore it and go with it.